Over the 9 years of research and practice in Instrumental Trans-Dimensional Communication (I.T.C), 5 years with spirit image work and 4 years with Electronic Voice Phenomena (E.V.P). 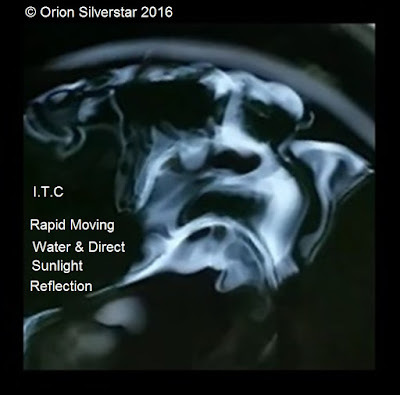 When it comes to the spirit image methods, mainly the Rapid Moving Water And Light Reflection. I have seen a steady increase in members of the public practicing and experimenting with it for themselves. Not only this but also many groups on different social media platforms in relation to this subject have formed. In where people are able to post images of their very own experimentation's. It would be safe for me to say that there has been a small revival of interest in all forms of I.T.C. The upside to this is that it introduces others that may not have ever heard of I.T.C to these very interesting forms of spirit communication, it brings about more awareness. In regards to those in the worlds beyond our very own, this is one of the very motivations behind these forms of spirit communication. Many people today wish to see good solid evidence of the spirit world and are not happy just to settle with a mediums message on the subject. Along with this, there are many people who are terminally ill or have lost a loved one. Human or pet, they need some reassurance that physical death of the body is not the end but is in fact a transition. One of the things these forms of spirit communication through I.T.C will give someone, is hope and reassurance. Although from an early age I have had the abilities of a medium, when I first found out about these methods of I.T.C it added a whole new perspective on working with the spirit worlds. Now I was able to show people what is around me on a daily bases and is a big part of my life, through the methods of I.T.C. The downside to this new found interest from members of the public in these methods of I.T.C. Is that many who are now practicing this and sharing their photo`s on social media platforms are not taking notes as part of the research into I.T.C. I feel that at times it has come to the point where people post images and say "wow look what image I captured" and that is as far as it go`s, till their next photo. In reality, even though as I say there has been a revival in I.T.C experimentation. There is only a hand full of us around the world doing the actual deep research into all methods of I.T.C and we often keep in close communication with each other when we can do so. This then leads me to the next part of which I wish to talk about. In regards to my very own research and experimentation in these methods of I.T.C. As I am a practitioner of the esoteric path, I learn`t in my training many years ago that it is very important to keep a journal and a dream dairy of all the works I do. This involves, moon phases, planetary positions, feelings experienced, time, date and more. Although this maybe new to some people that do not practice anything related to esoteric traditions. It is, for the sake of research important to make notes on a few things while doing a session I feel. 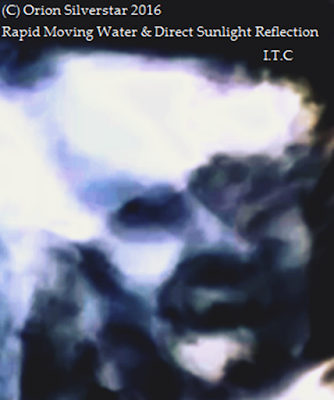 There have been some interesting findings that I have come across in regards to the Rapid Moving Water and Direct Sunlight Reflection Method of I.T.C. On talking with other researchers into the Rapid Moving Water and Direct Sunlight Reflection Method of I.T.C. We have all found that there is times when lots and lots of images will come through in the water. We have also found that their will be times when not one single image will come through in the water, this I call a "Dry Patch". For awhile I could not understand why this happened, however just recently due to taking notes I have connected the "Dry Patches" to some other phenomena. I have found that the "Dry Patches" have a lot to do with the phases of the moon. This is hardly surprising to me, given the fact that the moon has an influence on water. One example of this can be found in the tides of the sea or river, another example would be the behavior in human beings. As we humans are mostly water anyway, it is hardly that surprising. Another thing I found was that this method of I.T.C was subject to the positions of the planets and time as well. This reminds me of working with different Angelic beings, how different Angelic beings will only show at different times. Also how some Angelic beings are assigned to different days of the week. How the elements and some planetary positions are more favorable than others depending on the spiritual work been done at the time. Other things I have also found is that the best times to do a Rapid Water and Direct Sunlight Reflection Method session was just before sunset and just before sunrise. I have also spoken to other I.T.C researchers who do this method as well and they have found the very same thing. It is also interesting to note that Akasha, the all-pervading field in the Ether in which a record of past events is imprinted is strongest just before sunrise. Down further in this article I talk about how it has been proven that water has or holds memory. I have also come to realize that when I am doing an I.T.C session of this nature, if my cats are around at the time I am very much likely to get images of cats come through in the water. If my dogs are around at the time, then I am very much likely to get dogs coming through in the water. If nether my cats or dogs are around at the time, then I will often get many other animal spirits coming through except dogs and cats. I firmly believe that there is a deep connection between the energies of my pets and what is happening in the I.T.C session while they are around. This reminds me of times I have taken photo`s of my pets and noticed different coloured balls of light near or around them. 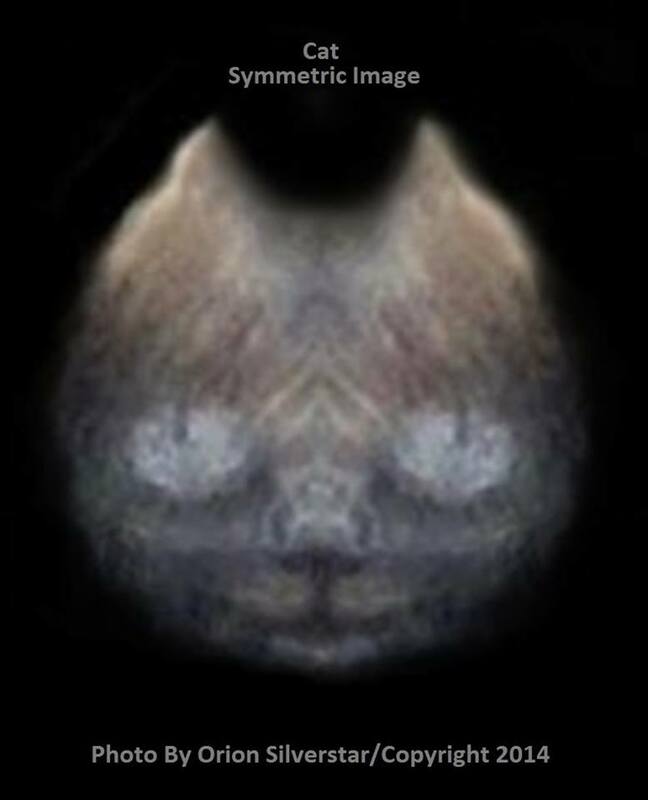 This I believe to be that of spirits around my animals, and more than likely animal spirits also, going by my research mentioned above. The two animal spirit photo`s above came through using the Rapid Moving Water and Direct Sunlight Reflection Method of I.T.C as did all the photo`s in this article. However, these two images came through as half a face, then using the help of Symmetric software, I was able to reconstruct the other half of their face to the photo`s you see here above. Some people have suggested to me that I maybe projecting the images of my mind into the water, which is a paranormal event in itself. This most certainly is very possible due to humans being able to change the structure, vibration and frequencies of water through thought and even sound. It has also been noted by a certain scientist of recent years that water has memory and that it is a living Entity in itself. The thing is, when I am doing an I.T.C session of the method mentioned, I am very much in what I would call a small trance like state. As I watch the movement of the water and the flashing of light upon the water, it has a mild hypnotic effect on me. I have also over the years managed to master the ability of being able to clear all thoughts from my mind so that I am thinking of nothing at all. Then hold it like this for sometime without letting any other thought enter my mind. Anyone should be able to learn how to do this with a lot of training, discipline, practice, concentration and meditation. I am also very good at projecting images from my mind into things, for example talismans, charms and more. I also can send these images to far away places, even on the other side of the world. 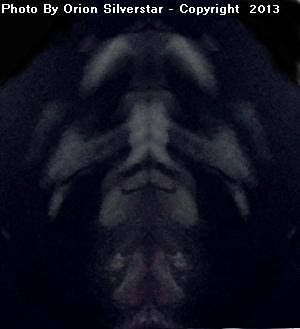 An example of this would be for me to construct an image of someone in front of me using my third eye after looking at their photo for a little while. Then send energy into that persons constructed image, visualizing that image going to the physical person and into the person. This is a type of thought form creation and can be very helpful to someone for healing. However it is always important to get the persons permission first before attempting something like this. So I am very familiar in regards to these matters and know without a doubt that this is not what is happening when I do a session using the above mentioned method of I.T.C. Before I ever start a session I first have to feel the spirits around me, as they will first communicate with me by other different ways. Then if they decide to show their formations by manifesting their images in the water. It is really depending on them and of course that which I have mentioned above in this article. If you have any questions in regards to this article above, please feel free to ask me by leaving a comment below, I am more than happy to help you if I can ~ © Orion Silverstar 2016.